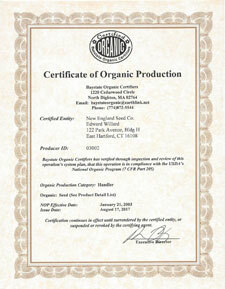 All of our Organic Seeds are Certified Organic by Baystate Organic Certifiers. Buy Heirloom and Open Pollinated Organic seeds from a company you can trust. We have generations of experience in the the seed business and store all of our Organic seeds under ideal conditions. All Organic seed is tested according to the standards of the Association of Official Seed Analysts and meets or exceeds federal requirements. Our non-GMO Organic seed is available in multiple sizes from retail packets to bulk. For added convenience, our bulk seed is packaged in heavy duty plastic resealable, moisture resistant pouches to help protect seeds during shipping and storage. 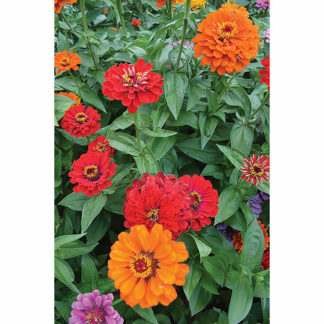 For the home gardener, we offer colorful and informative retail packets for many of our varieties. If you can’t find the variety you need Certified Organic, more than 99% of our conventional seed is available untreated in bulk. Many of our conventional hybrid seeds have no organic equivalent and can be used by Certified Organic farms (please contact us for more information). You can view the PDF of our Baystate Organic Certifiers certificate here.